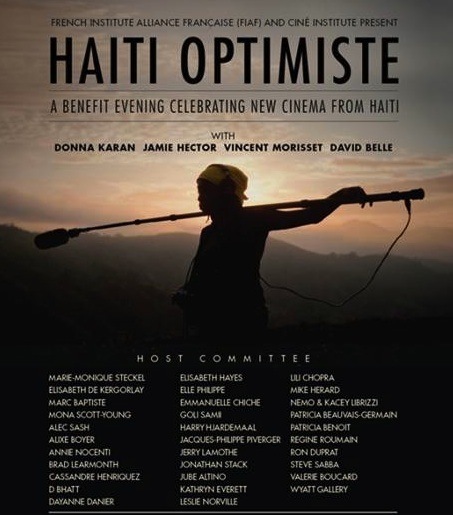 The French Institute Alliance Française (FIAF) and Ciné Institute recently held an event supporting Haiti Optimiste, Haiti’s respected film school. The star-studded event, at FIAF’s Florence Gould Hall, featured a night of film viewings and discussions. Designer Donna Karan, Arcade Fire video director Vincent Morisset and actors Michael Kenneth and Jamie Hector all attended the celebration with a cocktail reception following the event. “Our annual gathering to celebrate young Haitian talent at FIAF is always the high point of the year for us. Haiti Optimiste allows us make a vital institution for arts and creativity in Haiti stronger and stronger each year. We couldn’t be more grateful to our co-hosts, Donna, Michael, Jamie, and Vincent, to FIAF, Brioni, and to all the event attendees for their extraordinary support.” — Ciné Institute founder David Belle. Along with the the support, the Arcade Fire Reflektor Project short film ‘Just a Reflektor’ was also shown. Directed by Vincent Morisset and filmed in Haiti, shows an adventurous young woman traveling between two worlds. This interactive film explores the themes in Arcade Fire’s latest album ‘Reflektor.’ Love it. Haiti Optimiste with Donna Karan at FIAF written by Allison Ripa.